Croplands Equipment is a manufacturer of spraying equipment for all markets related to crop protection and land management. Their product range includes high quality spraying equipment, accessories and components, strengthened by long-term relationships with the world’s leading makers of equipment for the spraying industry. 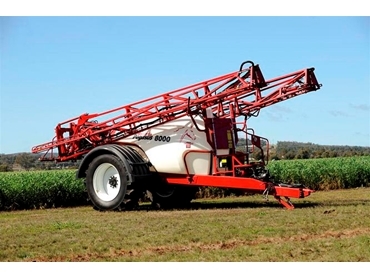 The new Croplands 8000L trailed sprayers have been designed to cater to the increasing demand for larger sprayer capacity. These new sprayer machines feature an 8000L tank complete with a 700-litre fresh water tank. Both tanks are designed with a low centre of gravity and the smooth tank walls allow for easy cleaning, inside and out. Fitted with Croplands 33m or 36m booms developed specifically for the demands of Australian agriculture, other features include engineered heavy duty centre section, pendulum self levelling and superior yaw control providing consistent application every time. A new multifunction straightforward liquid control system is located in an easy-to-access area of the sprayers, continuing the theme of simplicity and ease of operation that Croplands promotes throughout their machines. The machine has a heavy duty fully welded chassis with high tensile C-Channel beams welded into a box section to support the tank as well as provide complete structural integrity. Fitted with a high load rating adjustable axle of 3m to 3.5m and a heavy duty drawbar that incorporates an innovative absorption system to minimise horizontal to and fro movement whilst spraying, the Croplands 8000L Pegasus is built for performance and longevity. Pre-orders of the 8000L Pegasus are already placed throughout Australia with deliveries beginning in August of this year. For a limited time only Croplands will be offering a finance package of 6.5% on all broadacre trailed sprayers with tank sizes of 3000L or more. The limited offer finance program runs from 1st August 2010 to 30th November 2010.